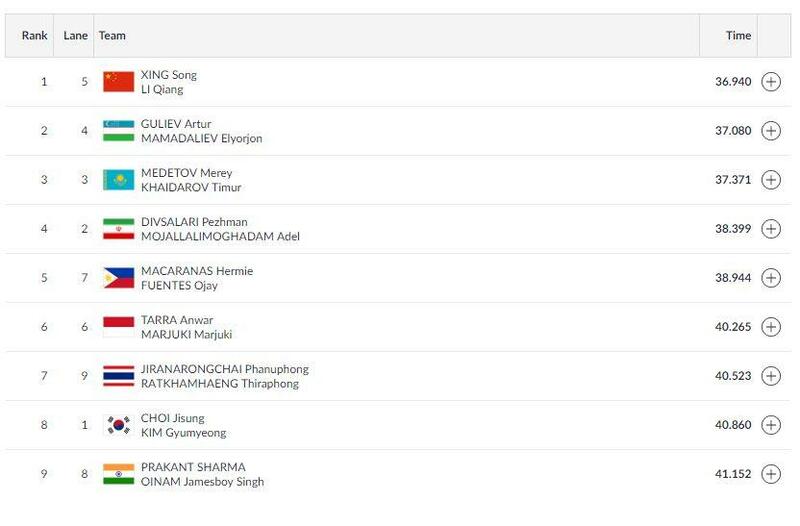 Meanwhile, you can follow the latest updates on the 2018 Asian Games Medal's Tally, here. Thank you for joining us. Hope to see you soon. And with that, India is eliminated from all the Rowing competitions. India finish 9th in the event with a timing of 1:51.729. The Women's Kayak Four (K4) 500m Race is about to begin! Stay tuned to catch the live updates as the race will be underway soon! One more race coming up at 10:00 AM. No medal in this one! The Indian pairing finishes last in their race. The race is underway! This is a medal event! Prakant Sharma and Jamesboy Singh Oinam in this one. The first event of the day is Men's Canoe Double (C2) 200m Final! The final day of the 2018 Asian games has arrived. Time has flown by and it has been a roller-coaster ride for India as they recorded their best-ever medal haul at the Asiad. Athletics proved to be the pleasant surprise as Indians went on to bag the maximum number of medals from their tally (19, including 7 golds, 10 silvers, and 2 bronze) in it. There were also few unexpected medals which came from Kurash, Rowing, Wushu, and Sepaktakraw. While there were also a few gold medals which India would have felt assured of bagging (kabaddi and hockey) that could not be won. However, this is the beauty of sports as anything can happen on the biggest stage of a multi-sporting extravaganza and the team which is better on the day, wins the laurels. In all, the Asiad has been truly satisfying and the Indians will be hoping to end their excellent campaign on a high by adding a few more medals to their kitty. Canoe and Kayak action continues on day 14 of the Asian Games. India have a good chance at winning medals in both the finals.